The band is made up of ringers from across the country and have been ringing for services at St Martin in the Fields for over 25 years. We ring the bells every Sunday between 9am and 10am prior to the Eucharist service as well as for other special services throughout the year. Due to the high number of bells in London and the limited supply of ringers, members are often also members of other bands including Southwark Cathedral, St Magnus the Martyr and St John’s Waterloo. 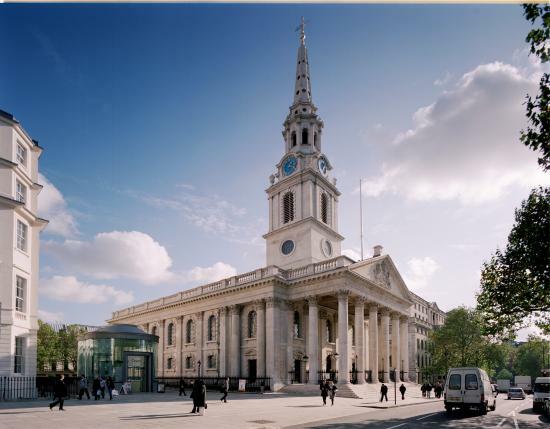 There have been a set of 12 bells at St Martin in the Fields since May 1727. The current bells were cast in June 1988 by Whitechapel Bell Foundry, London. The first ring of 12 bells dates back to May 1727. The following March there was a ringing match between the Society of College Youths and the Society of London Scholars. On the 14th the Scholars set a record by ringing the longest 12 bell peal - 6000 Grandsire Cinques. The next day their rivals rang 6134 in the same method. There is no account of what the parishoners thought of this contest! In the 1750s the Society of Union Scholars, who had rung at St Martins since 1736, disbanded and a split in the College Youths between the juniors and seniors resulted in the senior branch making the church their home. In 1788 they disbanded, and the juniors came to St Martins. They stayed until 1849 when they moved to Southwark. The vacancy was filled shortly afterwards by the Society of Royal Cumberland Youths. It has been our headquarters ever since - for over 150 years. The bells of 1727 remained at St Martins for many years (although the trebles were recast in 1758 and the tenor was replaced in 1726 owing to it crashing to the floor due to a broken gudgeon). Despite a re-hang in 1912, they were difficult to ring, partly due to being hung too high. In 1984, the decision was taken to replace the bells with a new ring and planning began. A new home was found for the old bells when the Australia and New Zealand Association of Bell Ringers asked if they might mark the Australian Bicentenary in 1988 by transporting the bells to the University of Western Australia in Perth, and hanging them in a purpose built tower. Renison Goldfields Consolidated Ltd sent to London 12 tonnes of Australian copper and tin to provide the new bells and fund raising by the Cumberlands began. By June 1988 the new bells, cast by Whitechapel Bell Foundry, were ready. In bell ringing, a peal is the name given to a specific type of performance of change ringing. Currently, for a performance to be recognised as a peal, it must consist of sufficient numerical sequences, or "changes" (at least 5040 changes on up to seven working bells or 5000 non-repeating changes on higher numbers), along with meeting a number of other criteria. All peals also have to be published in The Ringing World to be counted. At St Martin's a peal typically takes between 3 and 3.5 hours, however, some have taken more or less time to complete. The band at St Martin's have a dedicated team of five officers who are responsible for the day to day running of the tower and the band. Each officer is elected at the St Martin's Band Annual General Meeting held in Febuary every year. For more information about a specific officer click on their face or name. To contact them click on their face or name and fill in the contact form at the bottom of their page. Visitors are welcome at the open practices and Sunday morning service ringing. If you wish to join us on any of the following dates please contact the Captain. Please note that at some towers on practice night the door will be locked 30 minutes after the start time. If you think you may be late please contact the Captain and let him know. Sunday morning service ringing is always held 9am - 10am prior to the morning Eucharist unless stated in the events below. It is not usually possible to watch the ringing during peals, quarter peals or when visiting bands are ringing. If you are a bell ringer and wish to book a piece of ringing, please contact the Secretary. How are our bells rung? Unlike bells in mainland Europe which are mostly hung for swing chiming with a rope or lever attached to a 'headstock' (a heavy piece of wood or metal which sits across the shoulders of the bell), English church bells revolve through 360° - referred to as 'full circle ringing'. This system of ringing developed from the mid-I6th century onwards. Each bell is hung in a frame and the bearings at each side of the headstock allow the bell to rotate through 360°. The bell is fitted with a wheel and rope and is rung from the floor below by the ringer pulling on the rope, which passes around the wheel which is attached to the headstock. The bell starts in the 'mouth down' position and has to be rung 'up before ringing can commence. The ringer does this by pulling the rope repeatedly, gradually making the bell swing higher and higher until it rotates through a full 360° every time the rope is pulled. Once raised, the bell completes one revolution at each pull of the rope, from mouth up to mouth up and then back the other way, the bell striking once towards the end of each revolution when the 'clapper' inside the bell strikes against the inner rim (the `soundbow). To prevent the bell turning through more than 360°, a wooden bar attached to the headstock catches on a moving 'slider' attached to the frame beneath the bell. After raising, a bell at rest is mouth upwards in the 'up' position. Change ringing originated in the early 17th century, when bell ringers found that swinging a bell through a large arc gave more control over the time between successive strikes of the clapper. This culminated in the English custom of ringing bells through a full circle, which enabled ringers to accurately ring continually-changing sequences, known as "changes". The method is committed to memory by each ringer using many techniques to make it easier to remember, so that only a few commands are given by the ringer in charge (the conductor). Please contact us if you would like more information on Change Ringing or the methods we ring! For more information visit the Discover Bellringing website here (external website). The St Martin’s Band of Bellringers gathered in the crypt at St Martin in the Fields at noon on the 4th February to attend our Annual General Meeting, it was a productive meeting covering several topics, including officers’ reports for the year, election of new members and the ringing programme for 2018. A copy of the minutes and a ringing programme for 2018 is available from the Secretary, Chris Rimmer. The UK's largest festival of lights returned to London in January - bigger and better than before. For four evenings in January Lumiere London turned the capital into a dazzling nocturnal art exhibition. Installations from some of the world's top light artists in five key areas were displayed across the city, each illuminated for five hours every evening for four nights. St Martin's Church hosted 'Echelle' by Ron Haselden - a neon pink illuminated ladder that was attached to the spire. 70 years ago John learnt to ring on the second at Holy Cross, Caston in Norfolk - a ring of six bells with a tenor of 9 cwt. John first rang for a service on the Sunday after Christmas, 1947 and it is very likely that his tutor, Charles Banham, stood beside him. John first rang at St Martin-in-the-Fields in early 1953 on a Sunday for service when he was stationed at RAF Ruislip. He was then was then posted to RAF Mildenhall, Suffolk, where he worked in the Meteorological Office. In 1961 John moved to Orpington, having taken a teaching job in Orpington, and started ringing regularly with the Society of Royal Cumberland Youths in London and elsewhere from 1962 onwards, one of their regular practices being at St Martin's, the Society's Head Quarters, on the first Wednesday in the month. John was involved in removing the old bells at St Martin's in about 1989 and, when the new bells were installed about 1990, began ringing at St Martin's regularly on Sunday mornings, being formally elected to the band in 1991. Aside from ringing at St Martin's John has been involved in huge advances in ringing including ringing in the first peal of Bristol Surprise Maximus for the SCRY. To date John has rung 504 peals of which St Martin's is his third leading tower at 23 peal! In John's spare time, aside from being in the tower, John servers as the Parish contact on the Bell Restoration Committee of the central Council of Church bell Ringers. A Committee which had contact with over 60 projects during 2016. The St Martin's band noted this occasion at the morning ringing on Sunday 14th January and John gave a brief, 3 minute talk about his ringing career to the congregation at the end of the service. Following the service, the band rang a specially organised a quarter peal of 1270 Spliced Maximus followed by a lunch to celebrate this huge dedication to bellringing. The Christmas period is always a busy time at St Martin's and the bell ringers are no different. This year we are ringing for a total of twelve services over December, each requiring between 8 to twelve ringers per service! 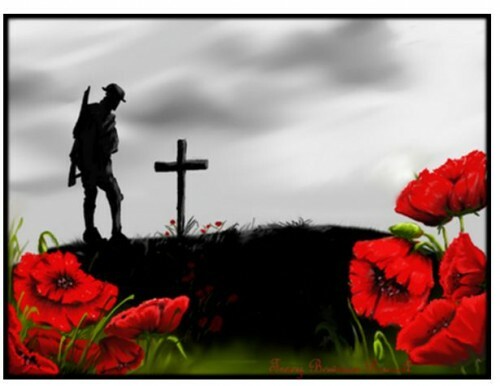 This morning, on Remembrance Sunday, the bells were rung half-muffled in remembrance and honour to those who have sacrificed themselves to secure and protect our freedom. The ringing included a 25 minutes touch of Stedman Triples. Following the unforeseen error with both our primary and secondary servers we host the St Martin's band website on, we have taken this opportunity to launch the new website. As this is earlier than planned it is not 100% finished and whilst the majority of the work is completed, we are still trying to improve it. Due to this we would appreciate any feedback you have! To submit feedback, please either email Ben M directly or use the contact form on this website. Please do let us have any feedback! If you have any news for the website, please let the Secretary know. The Captain is basically responsible for the running of the band's ringing. This includes running service ringing and practices and also organising competition bands. They also organise peals and quarter peals for special occasions. Jonathan learnt to ring in Birmingham in 1990. He then rang in York for several years before moving to London in 2005. He has been ringing at St Martin-in-the-Fields since 2009, and is a member of the Society of Royal Cumberland Youths. The Vice Captain assists in the Captain in the running of the band. This includes running service ringing when the Captain is not available and also assisting in organising the band quarter peals and peals. In addition to this they organise the towers for the weekly practices. Tim learnt to ring at the age of 10 and rang his first quarter peal in 2005. He developed further interest in ringing during his time at University in Reading. Tim is an active member of the Society of Royal Cumberland Youths and a keen peal ringer, recently marking his 250th peal. The Secretary is responsible for the administration side of the band. This includes liasing with the church, organising bands for special service ringing and organising the band social events. They are also the main point of contact for visiting bands ringers. Chris learnt to ring in Guildford, Surrey in 2007. In 2011 Chris moved to London and became an active member of the University of London Society, where his ringing developed very quickly. Chris rang his first quarter in 2012 and his first peal in 2012 at Epsom, Surrey. Since then he has rung over 50 peals and over 100 quarters. The Treasurer is responsible for the bell fund which is used to upkeep and maintain the bells at St Martin in the Fields. Sarah has been a member of the band for many years and actively supports service ringing. She is also an active member Southwark Cathedral Society of Bell Ringers. The Steeplekeeper is responsible for the maintenance and repair of the bells and fittings to ensure the bells operate correctly, easily and safely. Geoff learnt to ring over 40 years ago but had a long break, only returning to ringing in 2013. At the end of 2014, Geoff rang his first peal since 1971. Since returning to ringing Geoff has progressed very quickly and has been a regular Sunday Ringer at St Martin's for over two years. The Webmaster is responsible for the upkeep of the website. They ensure the information displayed on the website is corrrect. Between the webmaster and the secretary they try to ensure all events are listed on the website. Ben learnt to ring at Wisbech St Mary and Wisbech in Cambridgeshire. In 2001 he moved to Alford, Lincolnshire where his ringing advanced further. In September 2011, Ben moved to London and started to ring at St Martin's which allowed him to develop his 12 bell ringing. Since then he has been actively involved, held the position of Steeple Keeper, Vice-Captain and Captain and is a regular at both practices and Sunday morning ringing! Ben created the first band website in 2013 and then redesigned it again in 2017.